There’s a street party for all the family happening in historic downtown Seviervile Friday and Saturday, May 16-17, with a host of bluegrass bands, all kinds of barbeque – including the kind you judge in a prize-winning competition – arts and crafts and all manner of street fair entertainments. 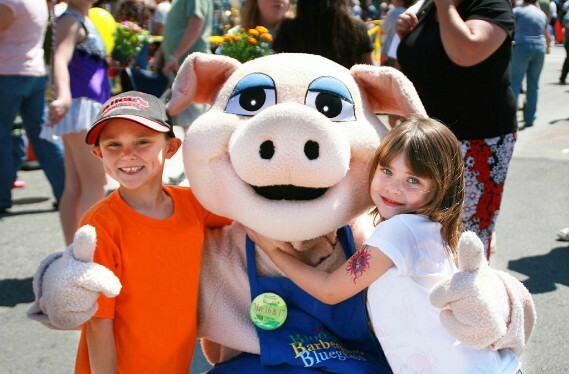 Yep, it’s the 10th Annual Bloomin’ BBQ & Bluegrass festival, Sevierville’s largest event and star performer in its Smoky Mountain Springfest. The event itself has been named Festival of the Year by the Southeast Tourism Society, and the Barbeque Cook-Off is an official barbeque championship of the state of Tennessee. It’s a free festival aimed at the whole family with the kids especially in mind. As well as the friendly pig wandering around giving free hugs to all the children in sight, there are children’s activities and arts & crafts for the kids too. The free music performances kick in at 5 pm Friday until 10, and with a late-night jam session starting at 11 pm. On Saturday the music runs all day and into the night. 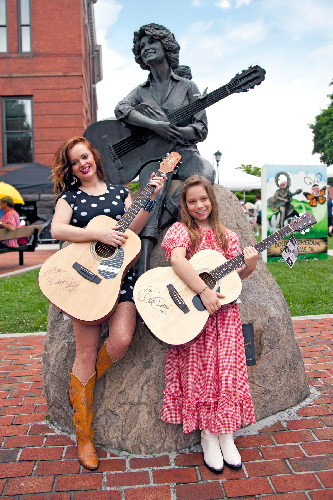 There’s a special treat at noon with little cutie Emi Sunshine performing on the main stage, followed at 1 pm by Willow Osborne – two young prodigies each of huge talent. Check the great lineup and schedule here. A unique favorite of the festival is the Mountain Soul Vocal Competition, which draws contestants from across the country performing their choice of song written by Sevierville’s own daughter, Ms Dolly Parton (a prolific songwriter of over 3,000 songs). Pictured here are the winners in the 13-plus and the 12-and-under categories, from Sevierville and Knoxville, so the local competition is pretty fierce for the out-of towners. There are more than fifty cook teams supplying their own special flavor, so come hungry when you show up because the air will be filled with delicious aroma. Meanwhile Arts and Crafts will flood the streets with around 50 vendors offering everything from African Shea Butter to pencil portraits on the spot, colored sand art (ready kids? ), crystals, jewelry, and artistry rendered in all conceivable media. For more information see the Bloomin BBQ & Bluegrass web site.